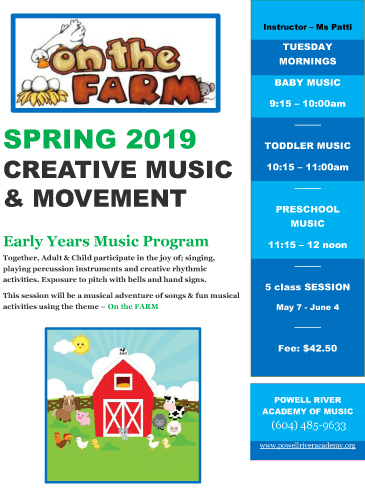 Ms Patti is preparing for On The Farm the 2019 session of “Yearly Years Creative Music & Movement Program” The program is offered at the Powell River Academy of Music for children ages 10 months to 4 yrs. Classes are held on Tuesday mornings beginning May 7 for a 5 week session. Together, Parent & Child will participate in the joy of creative musical games, songs and rhymes. Class content will stimulate babies' natural response to music and provide an introduction to music in an enjoyable, child-centered environment. We will Sing! And no matter how you may think you sound, your baby will be your most eager and adoring audience. Music will assist your baby to identify and respond to sounds, pitches, and patterns of language. Come play with music together! Class content will feature songs, chants, stories, movement & playing instruments in a relaxed, fun, interactive environment! Musical games will introduce children to speech patterns, sensory motor skills, and essential movement skills. Let the many elements of music nourish your toddlers rapidly developing brain. 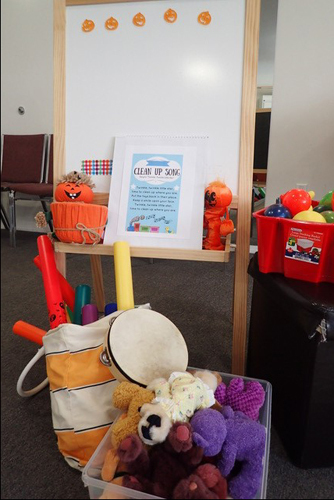 Class content will be a playful adventure yet structured enough to encourage the development of basic musical concept taught through the use of singing, musical stories, movement, puppets and games, creating and playing simple instruments. “Her love of music combined with her creative energy and understanding for young children will make this class an extraordinary experience not to be missed. Every once in a while things come along in life that seem too good to be true and Making Music Together classes for Patti will be just one of those things!" Patti has joined the Academy of Music Instructors after recently retiring from a long professional career in field of Recreation. Patti has a Degree in Education and years of program planning, facilitation, coaching & teaching experience with children & adults of all ages. Patti has a love and appreciation of music, that is home grown. She grew up in a very musical family, has been singing in choirs since her youth and performs as a musical duo with her husband at special occasions & community events. But it has been the combination of music & moment that has always played an important part in her life. The use of live or recorded music for mood, melody, rhythm or beat has been incorporated into the classes she planned, coached or instructed for; pre-school discovery play, dance, skating, aerobics & gymnastics. Music for Patti is a life long learning experience & she looks forward to leading this new program of making music a joyful experience for the Early Years.